Happy Halloween banner, perfect Halloween decoration to raise the atmosphere! 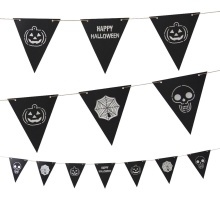 Happy Halloween paper banner, it consistis of 7 triangle flags and a piece of string. Hollow-out Halloween theme pattern: skull + pumpkin + spider or bat + ghost + witch. 3.5m string, can be hung on the ceiling, mounted on the walls and window, etc. Made of black paper, which helps create horror atmosphere. Suitable for home, school, shop and more. Note: the flags and the string need to be strung together by yourself.